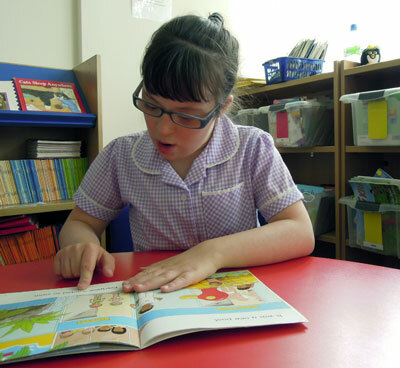 Our Reading and Language Intervention for Children with Down Syndrome (RLI) is an evidence-based programme designed to teach reading and language skills to children with Down syndrome. RLI incorporates best practice in structured activities delivered in fast-paced daily teaching sessions. It was evaluated in a randomised controlled trial and found to improve rates of progress compared to ordinary teaching. RLI provides individualised reading and language instruction designed to meet the particular learning needs of students with Down syndrome. It is based on interventions that have been shown to be beneficial for other children experiencing language and reading difficulties, and incorporates the principles of best practice for all children. Researchers at Down Syndrome Education International and at The Centre for Reading and Language at the University of York developed and evaluated RLI in a study that was funded by the Big Lottery Fund. RLI builds on earlier work on reading and language interventions at the University of York, adapting teaching techniques to meet the learning profile of children with Down syndrome. The primary findings of the trial were reported in a paper published in the Journal of Child Psychology and Psychiatry. This web site provides information about the design and evaluation of the intervention, including a report of the study findings. We are publishing a Teacher's Handbook, written by the project team and describing the intervention in detail. The web site provides information about the handbook and about other resources and support available for educators wishing to implement the teaching programme with pupils with Down syndrome.